After reports about the Federal Trade Commission’s legal complaint against bogus T-Mobile charges surfaced, subscribers of the wireless carrier who believe they were fraudulently charged wonder how to get their money back. However, getting the money T-Mobile siphoned without consumer knowledge reveals to be an uphill climb. FTC’s investigation reveals how T-Mobile refused refunds to some customers, offering just two months’ worth of the charges. Customer representatives often tell subscribers to seek refunds directly from scamming third-party services instead, without providing clear information on how to do so. 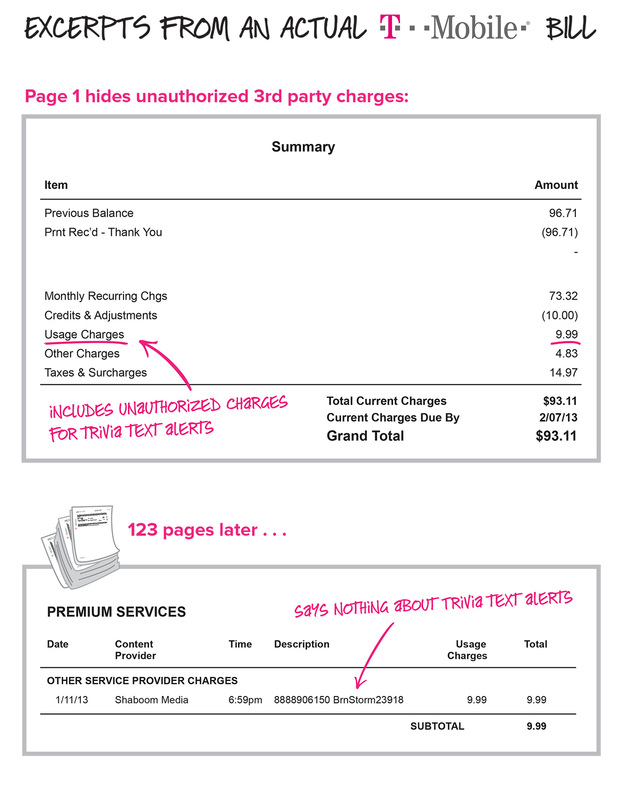 Check for unauthorized charges – An average T-Mobile bill could reach up to 50 pages, but you need to examine your bill carefully and look for the Premium Services section, which could be a subsection of something called “Usage Charges.” These unauthorized charges appear on the bill as $9.99, although some customers are charged as low as $2. They may also have a suspicious company name attached to it, like “Shaboom Media,” together with an undecipherable string of letters and numbers. Check the photo above for reference. For some customers, there is more than one charge and chances are this has been going on for quite some time. Grab your old printed phone bills (or your 12 months of online phone bills that you can access through your T-Mobile account) and see if you get credit for all of the unpermitted charges. Demand your money back – Insist on a full refund when you call T-Mobile’s customer service at 877-453-1304 or press 611 on your mobile phone. It is unlikely you will receive any hesitation from customer representatives given the FTC’s action. Report T-Mobile to FTC – Even though the agency has filed a complaint, you can still add your voice to the growing list of dissatisfied T-Mobile customers. Visit the FTC’s online Complaint Assistant or call 877-382-4357 to file a complaint in English or Spanish. Never give up your mobile phone number for a freebie – This is more of a prevention tip. Mobile phone subscribers often get spammy text messages after giving away their cell number in exchange for freebies, which are actually subscription sign-ups. Keep your guard up.